Pictured (left to right): Girl Scouts Emily Antos and Victoria Mercouris and McPeak's Assisted Living resident Muriel Lizak. 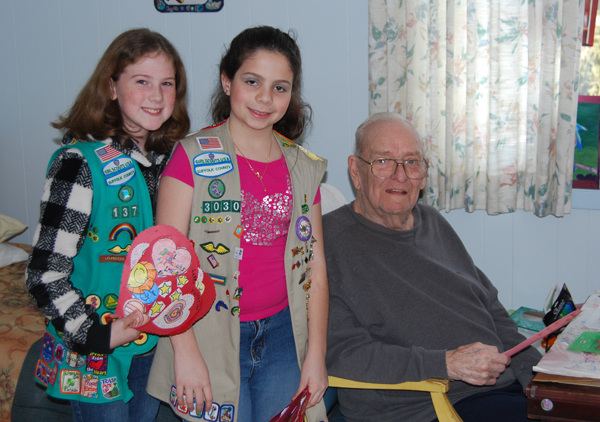 On February 14, as part of their community service, Emily Antos, a Junior Girl Scout from Troop 137, and Victoria Mercouris, a Cadette Girl Scout from Troop 3030, distributed handmade Valentine's Day cards to residents at McPeak's Assisted Living. Both girls are from Bay Area Service Unit #32, which consists of Girl Scouts from Bayport, Blue Point, Sayville and West Sayville. The cards that Emily and Victoria gave out put a smile on the residents' faces and made this year's Valentine's Day a happier one for them as well.